Your puppy's third month is when your little Rascal stops being a baby. He's moving from a clingy toddler to a confident pre-schooler, ready to go out into the big, wide world. It's a lot of fun and the real bonding begins here. By the end of this month your little Rascal is going to be bigger, stronger, bolder... and more opinionated. Enjoy this month, he's not going to be little forever! He's also still in the Imprinting Period (first four months) and may still have some lingering anxieties from the First Fear Period. Your puppy's third month is when he becomes a butterfly - a social butterfly that is! Chances are your little guy will love attention, want to play, enjoy his lessons and generally will never meet a stranger he doesn't like. But do be aware of the effects of that first Fear Period and take things slowly if he shows any signs of fear or anxiety in new situations, or with new people. Move at his pace until he feels more confident again. Your puppy isn't dependent on his doggie momma anymore, he's 100% dependent on YOU now! Once you bring your new puppy home it's a really good idea to take him to your own veterinarian for a thorough check up as soon as you can. The biggest risk during your puppy's third month is that he'll catch a contagious disease. 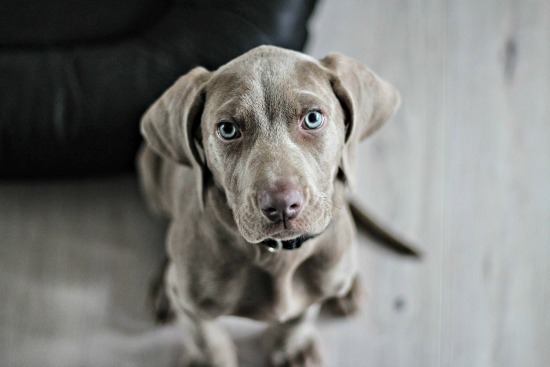 Illnesses such as Parvovirus, Coccidia and Giardiosis are serious, potentially deadly, and are relatively easy for an unvaccinated puppy to catch. So it's absolutely critical to make sure that your puppy isn't exposed to areas where he could pick up viruses or bacteria, or be around sick dogs. 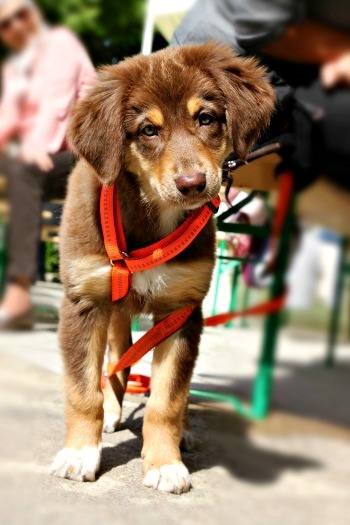 Vaccination can provide some protection against diseases, and personally I would recommend at least one set of shots (to include Parvovirus and Distemper) at around 16 weeks. Research is beginning to show that there are definite risks and adverse reactions to puppy vaccines, especially when associated with over-vaccination, including both short-term acute reactions and long-term chronic health problems. What your pup eats is also hugely important because he's growing fast and his little body needs quality nutrition in order to grow healthy and strong. 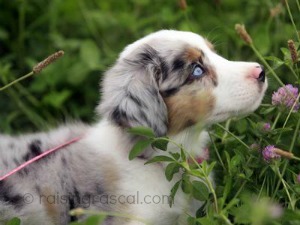 Large/giant breed puppies and extra-small or toy breeds have very specific (and different) needs when it comes to food. Make sure you choose a kibble that has been formulated for your pup's BREED size. During your puppy's third month his body really starts to change from chubby baby to a leaner, more 'leggy' child. 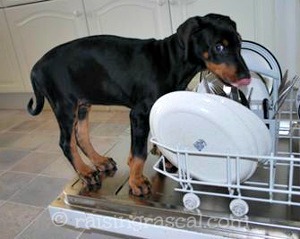 Pups can be clumsy at this stage, especially the bigger breeds. With puppies it's worth being proactive in the area of health. It's much easier, quicker, more effective and less expensive to treat a problem early than to let it turn into something more serious. They fall over their paws, their tails knock things off coffee tables and low shelves, they run into door frames and corners. It can be a mess, and there are often a few scrapes or knocks. Puppy proofing your home is important, and this is a good time to get a first aid kit put together too. Finally, Rascal starts to lose his baby teeth (aka 'milk teeth') during his third month. So chewing and nipping are still behaviors that little Rascal is totally committed to... in fact he's upping his game! There are quite a few things your puppy needs during his third month, and YOU are part of all of them. Although he's not a tiny baby nursing from his momma anymore, your little Rascal is still a 'child' and he needs the care and protection of his pack (aka your family) and especially his human mom or dad. That your little puppy is the proverbial 'blank slate' during this third month. Every minute he's awake he's learning something... so make sure he's learning the stuff you want him to! Housebreaking a puppy doesn't have to be a nightmare, and it's very important to get this right from day one. Socialization is a must during your puppy's third month, and it's easier now than it was in month two (when you had more worries about vulnerability to disease). The fact that your pup is bigger and more outgoing also helps, but do take it slowly if he seems anxious or nervous, even around things/people that he was totally fine with before. A bad or frightening experience now could leave emotional scars that it will take a while to heal. Don't let that stop you from getting him out and about as much as you can, but don't push him too far out of his comfort zone at this point. Slow and steady wins the race. 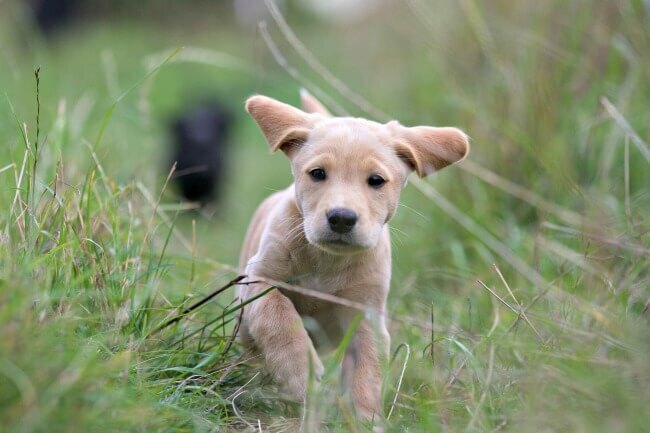 Your pup has been learning and absorbing everything around him since the day he was born, and as soon as you bring him home he'll be picking up on 'cues' and developing habits that will stay with him for life. This month your little Rascal needs to start learning how to live with a human family and what's expected of him in a world he knows very little about. Always remember, he's just a baby (and a baby dog, at that), he wants to please you and is eager to learn, so it's up to you to help him along. Don't expect too much, too fast. It's a recipe for disappointment and frustration (for both of you). Bad habits that get started when your pup is little, can sometimes seem unimportant - even funny or cute. But they're usually not cute or funny when your pup is a big, strong adolescent. Now and then they can even end up being dangerous. Biting and nipping, jumping up on people, running off or away from you, and chewing on things that are NOT dog toys, are all habits and behaviors that it's best to nip in the bud. 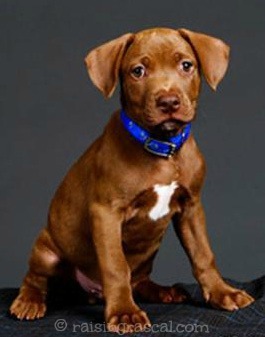 During your puppy's third month your responsibilities are (as always) to meet HIS needs. Make sure he's healthy and up to date on all routine veterinary care. Potty training your puppy is pretty straightforward if you follow a few simple, straightforward steps and are consistent and patient. 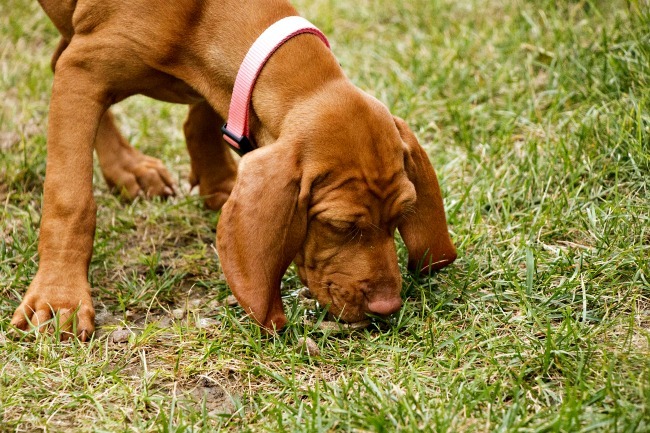 But, if you are easy-going or haphazard about this, especially during the first few weeks, you will end up with a very confused pup who's inconsistent with his potty habits. This can be a nightmare and take a long time to correct. So, from Day One make sure you show your pup exactly what you expect from him and help him be successful. Choose a premium quality puppy food and stick with it. If you need to change from the current food he's been eating, do that slowly over a period of a week to avoid an upset tummy. Start basic puppy training within the first couple of days, puppies of this age learn very quickly and are eager to please. Build several really short (2 - 3 mins max) training sessions into every day. Make them fun for your pup, with lots of praise and rewards when he 'gets it right'. No raised voices or punishment. Positive puppy training methods are the only way to go. 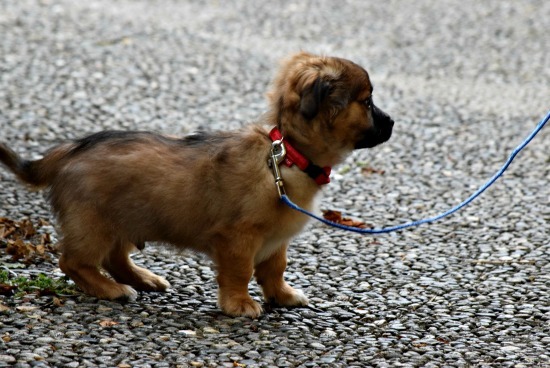 Leash training your puppy is also important as you'll want him to be able to take walks with you. Once little Rascal is old enough, and is vaccinated, he'll most likely be able to start a formal puppy training class at a local dog obedience school. The socialization experience is just as important as the actual lessons and you'll probably find that YOU enjoy socializing with the other new puppy parents too! You need to be on top of any unwanted puppy behaviors and stamp them out early. Biting, nipping, chewing and jumping are 'biggies' and most pups are troublesome in several (if not all) of these areas at first. Consistent, firm but loving discipline is the best way to discourage, and eventually stop, these types of behaviors. Don't get angry or upset because that will only ramp up the emotional atmosphere and make the situation worse. Don't expect overnight success. It doesn't happen. Patience, love and consistency are the keys. Relieve teething pain by providing a good supply of safe, sturdy puppy teething toys to chomp down on as well as using some simple puppy teething remedies. This helps relieve the pain in his gums and saves your furniture from some serious damage. During the early weeks in his new home it's important to encourage your pup to be comfortable with you handling his face, paws, tail, ears, lips, mouth and so on. Helping him to accept this as routine and non-threatening could make a world of difference if/when he needs to be examined closely by you or your vet, and will make teeth cleaning and dental care a breeze later on.